Silverstein J, Suleiman L, Yau C, Price ER, Singhrao R, Yee D, DeMichele A, Isaacs C, Albain KS, Chien AJ, Forero-Torres A, Wallace AM, Pusztai L, Ellis ED, Elias AD, Lang JE, Lu J, Han HS, Clark AS, Korde L, Nanda R, Northfelt DW, Khan QJ, Viscusi RK, Euhus DM, Edmiston KK, Chui SY, Kemmer K, Wood WC, Park JW, Liu MC, Olopade O, Leyland-Jones B, Tripathy D, Moulder SL, Rugo HS, Schwab R, Lo S, Helsten T, Beckwith H, I-SPY 2 TRIAL Consortium, Berry DA, Asare SM, Esserman LJ, Boughey JC, Mukhtar RA. Background: In women with breast cancer receiving neoadjuvant chemotherapy, residual cancer burden (RCB) predicts distant recurrence and survival. In those with high risk tumors, locoregional recurrence (LRR) remains a concern, and has been associated with type of local therapy received. We sought to evaluate the impact of local therapy on LRR in the ISPY-2 TRIAL. Methods: Data were analyzed in Stata 14.2, using Chi2 test, log rank test, and a Cox proportional hazards model. RCB was considered a categorical variable (0/1 versus 2/3), as described in prior publications. Breast surgery categories were lumpectomy +/- radiotherapy, or mastectomy +/- radiotherapy. Axillary surgery was defined as sentinel lymph node (SLN) surgery (≤6 nodes removed) or axillary dissection (>6 nodes removed). Results: Follow up data from the I-SPY2 TRIAL were available for 630 patients (median follow up = 2.76 years, range 0.4-7.2). Type of local therapy was significantly associated with clinical stage at presentation, with stage III patients more frequently undergoing mastectomy + radiation than any other local therapy (p<0.001). Women with higher RCB were more likely to undergo mastectomy than those with lower RCB (61.3% versus 48.8% mastectomy rate, p=0.002), and more likely to receive adjuvant radiotherapy (62.0% versus 53.9%, p=0.048). 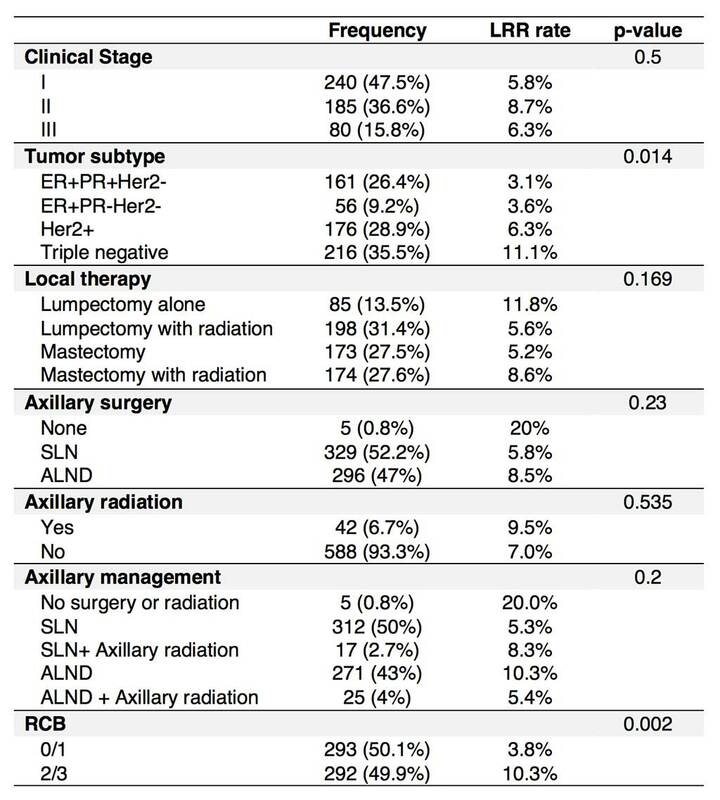 There was no association between clinical stage, type of surgery, or radiotherapy and LRR (Table). Higher RCB was significantly associated with LRR, with 3 year locoregional recurrence free rate of 95.1% in RCB 0/1 versus 89.9% in RCB 2/3 (p=0.003). In a Cox model adjusting for clinical stage, tumor subtype, surgical therapy, RCB status, nodal radiation, and age, significant predictors for LRR were tumor subtype and RCB status. Hazard ratio (HR) for LRR in those with RCB 0/1 was 0.39 compared to those with RCB 2/3 (95% CI 0.17-0.87, p=0.021). There was no difference in LRR between breast conservation and mastectomy; within the breast conservation group, those who had lumpectomy alone had higher hazard of LRR compared to those having lumpectomy + radiation (HR 3.1, 95% CI 1.1-9.2, p=0.043). Conclusions: Extent of surgical therapy was not associated with local tumor control, regardless of advanced tumor stage at presentation. Rather, tumor biology and response to therapy were the best predictors of LRR. These data highlight the opportunity to minimize the morbidity of extensive surgical therapy for patients with excellent response to systemic therapy.